Up North Riders ATV Club loses great friend and club VP. We sent condolences from our club to the many friends and family of Kevin Futhey, who died in a Ranger accident last week near McGregor. Kevin was their club’s VP. He helped organize last year’s ATVAM Fall Ride & Rally, was a wonderful man, a Trail Ambassador, and friend to all. Dennis Pinz says Hi from Nevada! Dennis and Liz moved from Longville out to Pahrump, Nevada, a few years ago. It’s 60 miles west of Las Vegas. He still keeps in touch, and sent us some ride photos a while back. He is part of a group of 10 riders in their 70s and 80s who ride their RZRs twice a week out on BLM lands where there are plenty of trails to explore. Some riders in his group have over 20,000 miles on their machines! Our team of Trail Ambassadors is growing this year, which is great. Welcome to all the new TAs! Hope to see you all at the DNR’s annual meeting of 200 TAs at Camp Ripley. Ed Anderson, our TA Grant Manager sent out an email, requesting everyone’s preferred TA ride dates and trails for the coming season, so he can put together our schedule and grant request to the DNR. It’s going to be another great riding season for our Trail Ambassadors. A number of Woodtick Wheelers head south for a month or three during the winter. This photo was sent in by Ed and Suzie Anderson. They spent some time at an RV Resort in Arizona, where Ed reports that it’s filled with Side-by-Sides, and once a week everyone heads out on a ride. ATVs are allowed on state highways in Arizona, and just about everywhere off-road. This photo shows some of them stopped for lunch at a food truck. If you have photos of your winter rides, please send them to us for the next newsletter! 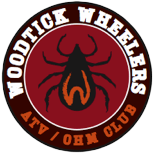 Are You A Woodtick Itching to Ride? Ramping up for 2017 meetings and club rides! The club board will soon be planning our schedule for the coming riding season. Watch for future emails with dates and details. First up: the spring meeting & pancake breakfast! ‘Like’ us on Facebook and visit WoodtickWheelers.com. Send us your ideas, places you’d like to ride, menu items for ride lunches, and other comments!